Colorado, like most states, forces convicted criminals to pay court costs, fees, and restitution after they’ve been found guilty. But the question arises, “What happens when someone who’s been found guilty, has paid their dues, and then has their convictions overturned on appeal? Do they get their money back?” Not in many states, like Colorado. But all of that has changed after a landmark ruling from the Supreme Court of the United States (SCOTUS). The state not stealing money from innocent people sounds like common sense, right? 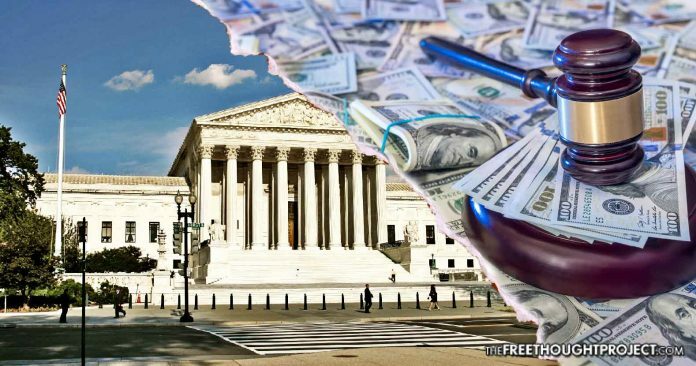 Well, unfortunately, in the land of the free, it was necessary for SCOTUS to step in and tell the greedy state that they do not have a right to steal people’s money. Colorado refused, even after the plaintiffs won in a state-level appellate court. The state, instead, insisted that if they wanted their money back, they’d have to file a claim under the Exoneration Act, forcing the defendants to once again prove their innocence to retrieve their funds. The plaintiffs appealed all the way to the Supreme Court, who sided with the citizens in a 7-1 ruling, declaring Colorado’s law unconstitutional. The decision, on its surface, may not seem like much but holds promise for putting an end to the much criticized practice of local law enforcement agencies around the country who engage in civil asset forfeiture. The Free Thought Project has worked diligently to highlight such fiscally abusive practices taking place all around the country. Take for instance rapper Blac Youngsta’s recent run-in with the law back in January. He was detained by Atlanta police withdrawing $200,000 cash from his bank account. He’d planned to take the money and buy his favorite sports car but police were notified and Youngsta was detained as being a possible bank robbery suspect. Youngsta and his entourage were apprehended while police pointed their weapons at them. The so-called authorities then put everyone in handcuffs, confiscated their personal weapons, and took half of the rapper’s $200,000 withdrawal saying he could get it back after it was processed as evidence at police headquarters. In essence, the police seized his money and forced the rapper to reclaim his own funds after proving he was entitled to it. They robbed him. The police shakedown made international news and smacked in the face of common sense, as many were left scratching their heads and asking how police could get away with doing what common street thugs often do, take other people’s money. Matt Agorist with TFTP reported, from 1998 to 2010, more than 12 billion dollars was raked in from law enforcement at all levels of government. This translated into the government taking away 600 million more dollars than all the robberies and thefts during that same period, making authorities seem more crooked than the individuals they’re trying to arrest. The Inspector General of the Justice Department concluded their practices constituted a threat to everyone’s civil liberties, and now, apparently, the SCOTUS agrees. Everyone is entitled to due process under the law and are likewise entitled to keeping their assets once they’re found not guilty in criminal court. It’s a good day to be an American. Maybe now law enforcement at all levels will stop such controversial practices.